Oh Say Can you See! 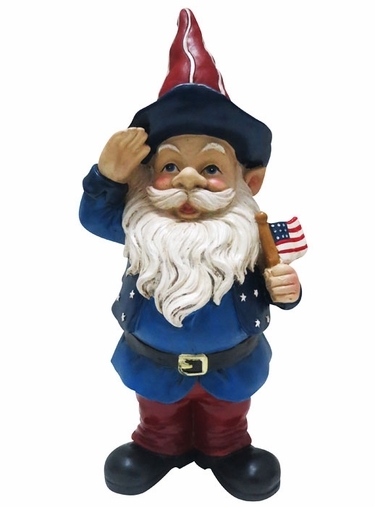 What a lovely and patriotic Americana Gnome this to be! Adorned in the stars and stripes of the good 'ol US of A, our full-sized 22" Americana Gnome will proudly serve his country forever after! Bring his friendly smile, long white beard, and red, white, and blue passion to your home garden today. There may even be room in his flag for a few bird seeds for cardinals and blue jays! Build to last, our garden gnomes are made from tough and durable weather-resistant cast resin. These full sized garden gnome statues are made to last till the saints come marching home! Complete the set with his 22" Patriotic Gnome companion!